One of the big events of the London social season didn’t actually take place in London at all, but twenty-ish miles south of the metropolis, in the small town of Epsom located on the rolling, grass-covered terrain of the North Downs. I am speaking, of course, of the Epsom Derby, the undisputed Queen of horse races. Epsom was known first as a spa town—the source of the purgative Epsom Salts—beginning early in the 17th century, and the infirm (and not-so-infirm) of London and beyond tottered there throughout the next decades to drink the water from one particular spring. 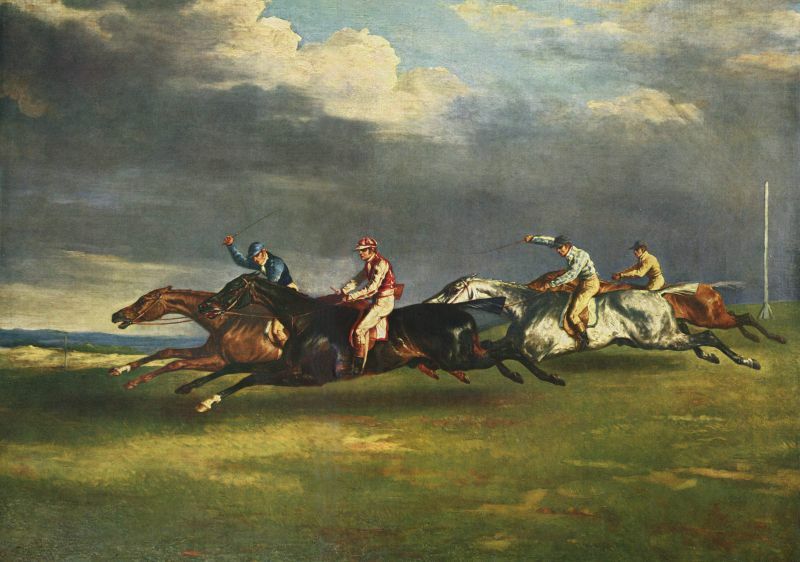 Horse-racing was first mentioned as taking place there early in the century—perhaps as a pastime for the healthy young members of families who accompanied older relatives visiting the spring. I can totally understand the attraction of galloping across the miles of open, green grassland! During Cromwell’s time racing was forbidden, but was back in force when King Charles II regained his throne; Samuel Pepys noted a visit there during which he saw Nell Gwyn, the king’s cockney mistress, having a merry time, and the King himself often attended races. By the 1680s there was an official course clerk, and fifty years later, twice-yearly race meetings were taking place. Then, in 1778, the Earl of Derby (that's him at left) and a group of friends including Sir Charles Bunbury, the playwright Richard Sheridan, and politician Charles James Fox, hatched the idea of a new race for three-year-old fillies, over one and a half miles (most races at Epsom were in the two-to-four mile range), naming it The Oaks, after Lord Derby’s nearby house. 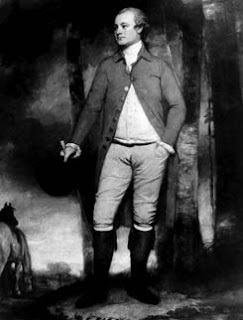 In 1780 they added a second race, for both colts and fillies, over one mile (soon expanded to one and a half); Lord Derby and Sir Charles flipped a coin for the honor of naming this new race, and Derby won the toss—and so The Derby was born. Sir Charles probably wasn't too upset—his colt Diomed became the Derby's first winner. Large companies from every part come in. And Squires without Estates, each other greet. Our friend Prinny, the Prince Regent, was one of those spectators; in the 1790s he built the first permanent structure at Epsom, the Prince’s Stand (a larger grandstand would finally be built in the 1830s). By the Regency, the Derby was an established “event” of the season, and an audience of thirty to forty thousand was the norm. 1810’s Derby, run on June 7, was no exception, drawing the usual hordes of racing enthusiasts from the lowest to the highest. What set it apart was the horse who would win that day, a three-year-old colt with “the lowest and longest, and most-double jointed horse, with the best legs...and worst feet I ever saw in my life," according to his groom. 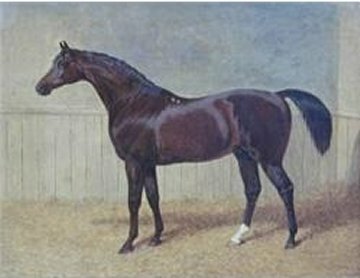 Whalebone, owned by the Duke of Grafton, was running only his second formal race ever; he’d won the Newmarket Stakes just the month before. But despite his unprepossessing looks, he was a grandson (grandcolt?) of the mighty sire Eclipse, and went out favored to win...and win he did, leading the field throughout the race. Though his subsequent career was a checkered one, with a pattern of grand wins followed by disappointing losses then back to wins, his greatest victories came after he retired to stud: he was the progenitor of champions straight through into the 20th century and beyond—not bad for a horse described by a contemporary as “shabby”!